I am on the bandwagon with Lori (Humble Quilts) once again. 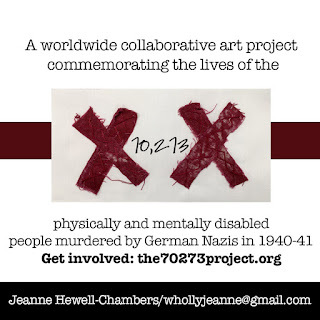 The 70273 Project is such an amazing and important endeavor, I hope that you will all take a moment to view Jeanne Hewell-Chambers’ blog (here). Since I don’t post any non quilt related material very often, many of you don’t know that I have a fantastic 5 year old grandson. It is beyond my comprehension that because of his autism, this little guy would have sported those two X’s on his report. I am one lucky Nana! This is what my special man made last weekend. 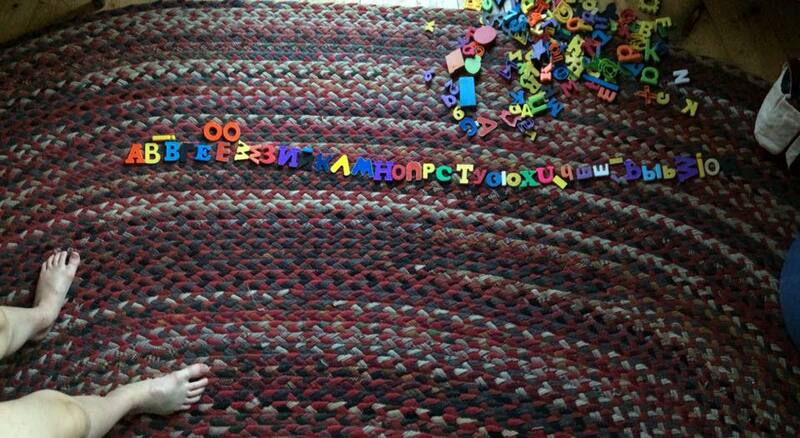 It took his parents a few minutes (they had to look it up) to realize he was making the Russian alphabet with only the English letters to work with. I think he nailed it! This is all from memory of a video he watched a few weeks before. What a treasure! He makes me truly enjoy all the gifts I have been given. Thank you Lori for the inspiration and the motivation to join in! 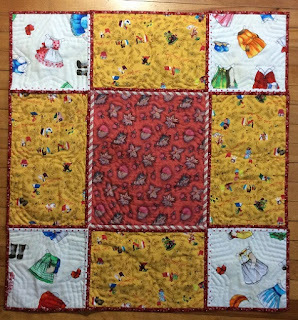 Cyndi (Busy Thimble) and I invite all of you to our “Small Quilts from Antique Inspirations” exhibition at Maine Quilts 2016, July 28 -31 at the Augusta Civic Center, Augusta, Maine. 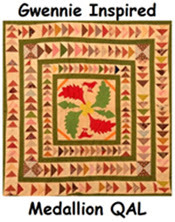 We have some fantastic antique quilts and amazing little reproductions. I finally finished mine and Cyndi is heading down the home stretch. Apparently, we both work best under pressure! She is reproducing a Maine potholder quilt and it is truly remarkable! Check it out (here). This is the antique I chose to reproduce. And here is my little baby. 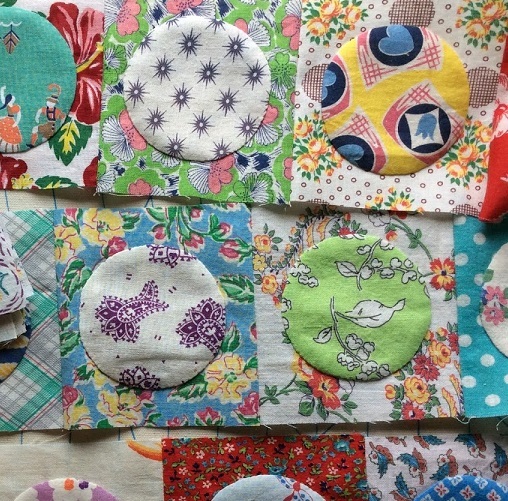 I had a lot of fun hand quilting those little clamshells! 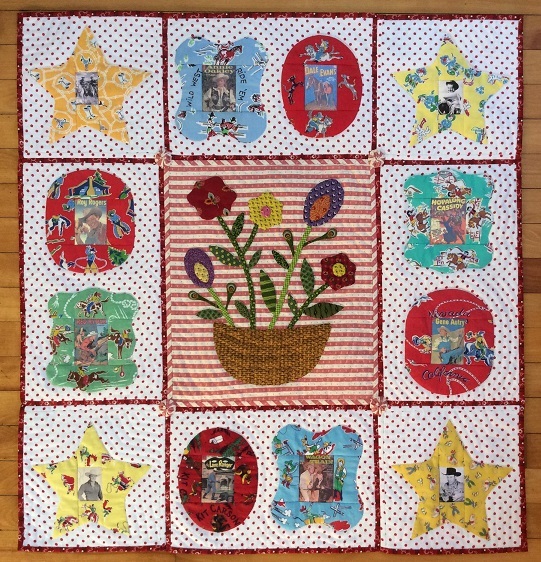 There will be over 600 quilts at the show this year! You won’t want to miss it. We will be posting photos after the show, so if you can’t make it to Maine, stay tuned. 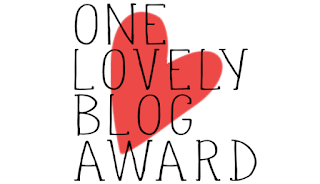 Dear Sweet Cecile nominated me for the “One Lovely Blog Award”. I am truly honored. I’m still relatively new to the blog world and had not heard of this award before. 2) Write a list of rules. 3) Put the photo of the Award. 4) Write 7 facts about yourself. 5) Nominate 15 bloggers and write them that you have nominated them. First of all, I would like to nominate every one of “my favorites” on the sidebar of my blog. I truly enjoy reading every one of them. I will stick to the rules and only nominate 15, but I am going to break the rules (as usual) by telling all of you who I nominate to not feel pressured into accepting the challenge. The rules seem simple enough, but it may be too much for those whose plate is full already. I do not wish to add to anyone’s burden at any time of year, but for some people (like me) summer is particularly busy. Thank you Cecile for thinking of me! 1) I am very fortunate to have a wonderful family. A delightful and very funny husband of 38 years, a son and wonderful daughter in law and a superb grandson, and a beautiful daughter and son in law. Wow! 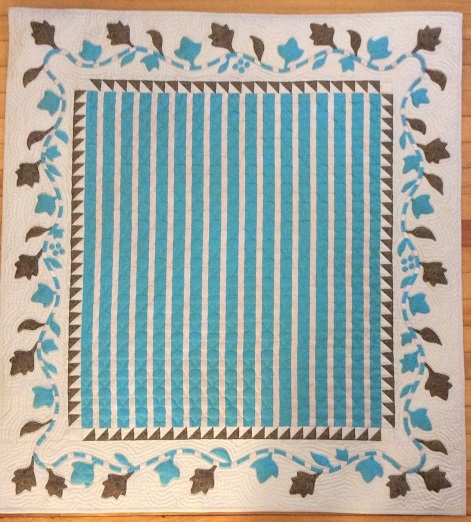 2) I made my first quilt when I was 9 years old (51 years ago!) under the gentle guidance of my 83 year old neighbor and I just never stopped. 4) I work in a marina/boatyard, which is why winter is my favorite season! I work full time, year round and I have to say it is prettier here in the snow. 5) I used to love gardening. Now I get much more satisfaction from watching the beautiful weeds pop up in my yard while I am quilting on the porch. 6) I love nature and spend as much time outside as I can. 7) I feel truly blessed to have genuinely wonderful friends. They are in no particular order except that I am starting with Lori, because she was one of the first people to encourage me to start my blog. I love all of the above and so many more. You all deserve the “One Lovely Blog Award”! Shenandoah Valley Botanical Album block (#10 already!) for July. The Moolon (or Mulan) Lily. I adore this block. My blocks, at 10”, are much smaller than the original, so I thought the outer rim of these flowers might be challenging. But, I enjoyed the challenge and they came out pretty well. I think this one is my second favorite, after the Liberty Tree! Do check out the link (here) and enjoy all the wonderful blocks. It is time for the big reveal of round two in our Gwennie Inspired sew-a-long. If you are just jumping in, here is a recap. Lori (Humble Quilts) started us off in May with her choice of “baskets” for the center. I have never seen so many creative and beautiful baskets. I love them all! 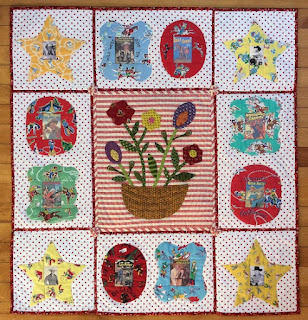 This month’s choice was made by Cynthia (Wabi-Sabi Quilts). Her theme of “Childhood Memories” was an absolute joy for me. I knew instantly what fabrics I would use as I spent most of my childhood wishing I were a cowboy riding the range! I incorporated vintage cowboy feedsacks and I also printed images of cowboy comic books as I spent hours and hours poring over them as a child. 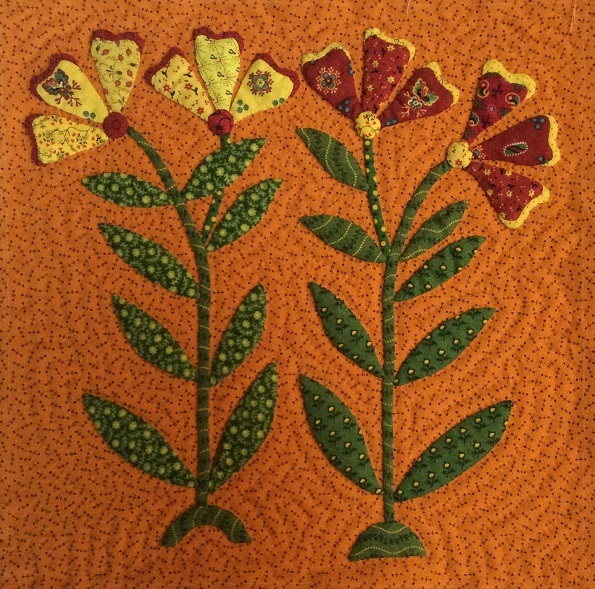 I am making this in the potholder method, whereby each border was appliqued, hand quilted and bound and then stitched together. 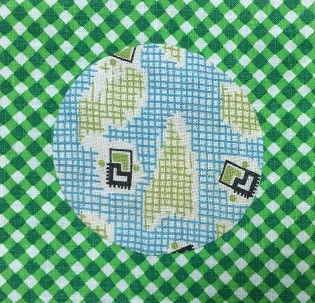 The backing fabrics are also special to me. The Little Golden Book fabric is a reproduction and is one of my favorites. I’d like to say that the panels are upside down because I used to read the books while hanging upside down from our apple tree, but the truth is I screwed up! When I wasn’t dreaming about being a cowboy, I was making paperdolls so the backing for the corner blocks is quite appropriate. I love the red binding, but I didn’t want it to be too heavy on the corner blocks so I used the background fabric on two sides. 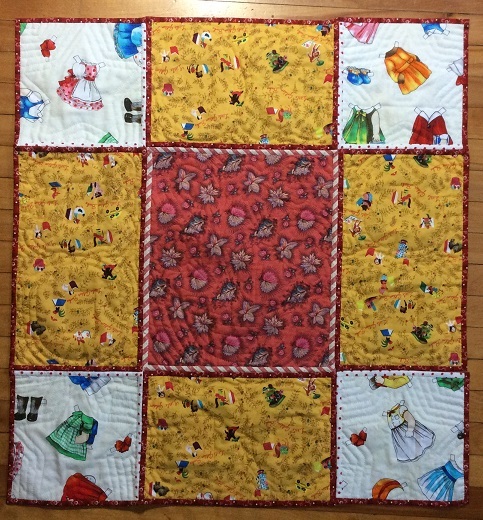 I added the little yo-yo’s at the intersections to tie in the striped fabric in the center and also because I loved making them as a kid. This one has Tim Holt inside the yellow star. 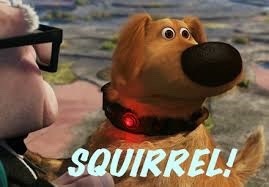 He was one of my favorites. He also did a lot of detective movies, but I loved him as a cowboy! I was cursing myself halfway through the process for deciding to make this in the potholder method. 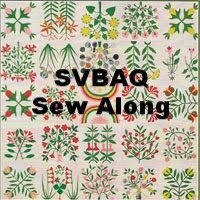 I’m not sure why it never occurred to me that I would have to applique, quilt, bind and stitch together ALL borders before starting on the next round. 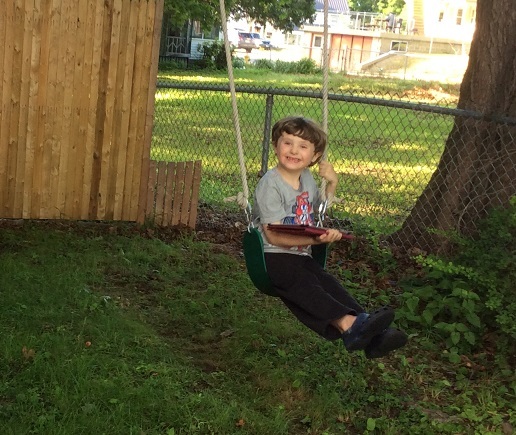 In the middle of the summer – really??? 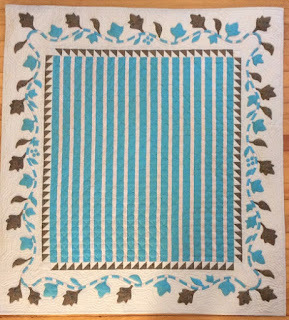 But I made it and I am very happy that Cathy (Big LakeQuilter) has chosen “Log Cabin” for the next border. I think I can do it quite quickly if I don’t over think it! So, check out all the wonderful progress at the linky party (Wabi-Sabi Quilts). 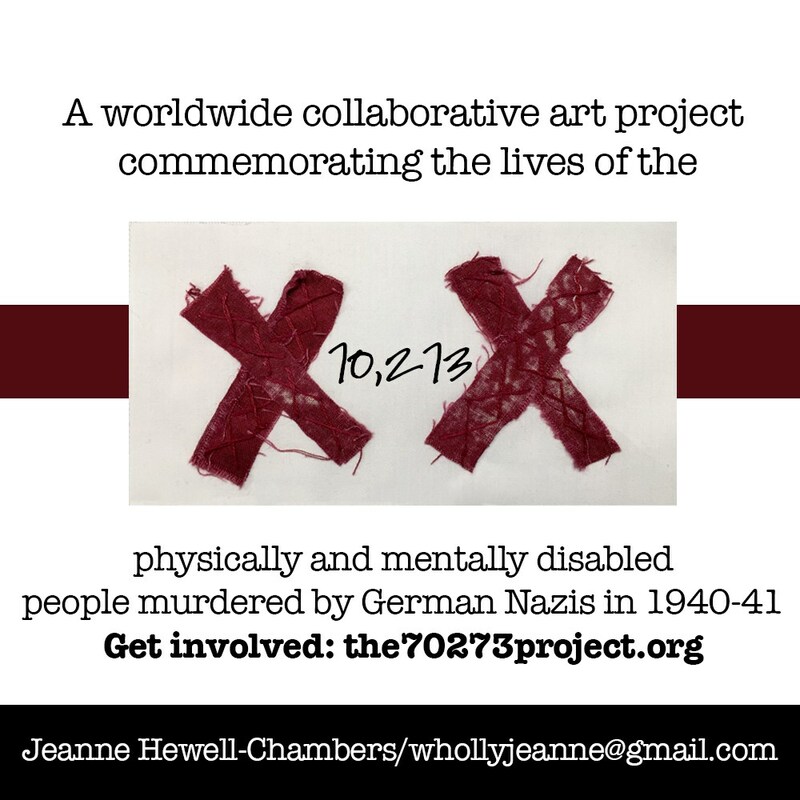 And remember, it is never too late to join in the fun! 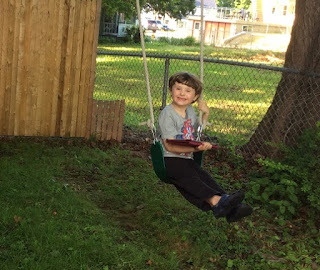 And, speaking of childhood memories… I rarely post anything not quilt related, but we put up a swing for our grandson last week and, well… weeeee! 237 Circles down! Only 128 to go! I have enjoyed this project so much that I am going to continue this next year with the background fabric that I have cut out behind the circles. Of course next year’s quilt will be smaller, but just as much fun I am sure! Thanks Audrey!